The Minerals at Risk and for Emerging Technologies Project of the U.S. Geological Survey (USGS) Mineral Resources Program is examining potential sources of lanthanide elements (rare earth elements) as part of its objective to provide up-to-date geologic information regarding mineral commodities likely to have increased demand in the near term. As part of the examination effort, a short visit was made to the Pea Ridge iron (-lanthanide-gold) deposit, Washington County, Missouri in October 2008. The deposit, currently owned by Wings Enterprises, Inc. of St. Louis, Missouri (Wings), contains concentrations of lanthanides that may be economic as a primary product or as a byproduct of iron ore production. 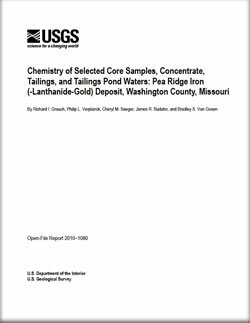 This report tabulates the results of chemical analyses of the Pea Ridge samples and compares rare earth elements contents for world class lanthanide deposits with those of the Pea Ridge deposit. The data presented for the Pea Ridge deposit are preliminary and include some company data that have not been verified by the USGS or by the Missouri Department of Natural Resources, Division of Geology and Land Survey (DGLS), Geological Survey Program (MGS). The inclusion of company data is for comparative purposes only and does not imply an endorsement by either the USGS or MGS. Contains tables related to this report. Grauch, R.I., Verplanck, P.L., Seeger, C.M., Budahn, J.R., and VanGosen, B.S., 2010, Chemistry of selected core samples, concentrate, tailings, and tailings pond waters: Pea Ridge iron (-lanthanide-gold) deposit, Washington County, Missouri: U.S. Geological Survey Open File-Report 2010-1080, 15 p.